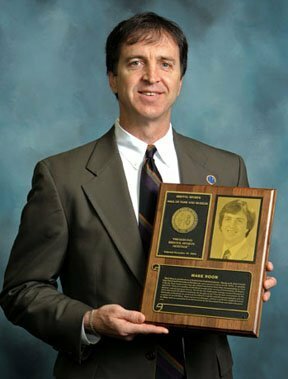 When the subject is brought up on who is Bristol’s best basketball player ever, among the short list of elite names mentioned is that of Mark Noon, St. Paul Catholic High School and University of Hartford standout in the 1970’s. A member of the St. Paul varsity team when the school won back­to-back state championships in 1974 and 1975, he set a number of individual records while earning all-tournament, all-league, all-state and all-American honors. He set the city single-game scoring record of 52 points in 1974, and earned the MVP award twice for his play in the Class M state tournament. At the University of Hartford, he continued his offensive exploits and all-around solid play and set a number of records there. Noon won several all-league, all-East and All-New England awards in college and was named 1st team All-American by the Associated Press and others his senior year.